The Monte Rosso vineyard is located in the Mayacamas Mountain range nearly 1,000 feet above the Sonoma Valley. 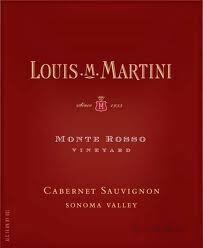 Louis Martini has an amazing history as one of the first wineries to make wine in the Napa Valley and although I won't go into that history, you can check out the timeline here. The 2005 Monte Rosso Cab is composed of 93% Cabernet Sauvignon and 7% Petite Verdot, and was aged in 90% French oak and 10% American oak barrels. On the nose I get aromas of black raspberry, savory milk chocolate, chocolate covered raisins, and sweet tobacco. It's a beautiful bouquet and one that expresses the best of California's abundant sunshine. It's fruit- driven and full of luscious black fruit aromas. On the palate I get flavors reminiscent of black raspberry, black plum, chocolate covered raisin, and black cherry. There's some really nice plush and ripe tannin, lots of fruit, and not a whole lot of earth or soil driven notes.